Learn more about the Heartland Rural Health Network in RHIhub’s Rural Health Models & Innovations. Heartland Rural Health Network Community Health Worker Karen Nutter coaches diabetic patients in their homes to help them improve self-management of their chronic disease. Carol B. has lost more than 100 pounds and cut her blood sugar averages in half since being diagnosed with Type 2 diabetes. But, she says, her disease is almost impossible to effectively control, so she is grateful for the professional assistance she receives from Heartland Rural Health Network (HRHN) in Avon, Fla.
Uncontrolled diabetes leads to serious and costly complications such as heart disease, stroke, blindness, kidney failure and lower limb amputations. HRHN’s diabetes program and Kentucky’s KIPDA Rural Diabetes Coalition (KRDC) are among federally funded grant programs with the purpose of helping people prevent development of diabetes and helping already diagnosed diabetics help themselves. Shahady reported in Clinical Diabetes that DMCP has helped its patients attain better control of their diabetes while offering them significant cost savings. The American Diabetes Association (ADA) sets control goals related to lowering A1C, cholesterol and blood pressure levels. DMCP’s free services for providers include a web-based diabetes registry, in conjunction with education and networking support for physicians. DMCP currently has 23,466 patients and 138,487 visits in its registry. Initiated by the Florida Academy of Family Physicians, DMCP is supported primarily by grants and donations, serving provider practices in Florida, Georgia, Oklahoma, Missouri, Illinois and North Carolina. Seventy percent of members are in rural locations. Shahady said DMCP is also expanding its relationship with physician practices in additional states. The incidence of diabetes is about 17 percent higher in rural areas and racial and ethnic minorities are also at higher risk of developing the disease, according to Rural Healthy People 2020 (RHP) Co-author Jane Bolin, director of Texas A&M’s Southwest Rural Health Research Center in College Station, Tex. Bolin said rural populations and some minority populations are also affected by diabetes complications to a greater degree, such as having higher rates of lower limb amputations, cardiovascular disease, renal failure, and blindness. Anecdotally, Bolin and her study team have learned that many young Hispanics just expect to get diabetes because their parents and grandparents did. Changing cultural habits, such as tortillas at every meal, is difficult. They don’t understand that learning to make good choices and changing diet can help them avoid getting diabetes. They may not know the status of their blood sugar, A1c or urine albumin because they don’t have access to regular medical care. According to The Disparate Impact of Diabetes on Racial/Ethnic Minority Populations, Hispanics, American Indians, Alaska Natives, black or African Americans, Asian Americans, Native Hawaiians and other Pacific Islanders have a higher prevalence of Type 2 diabetes. Some minority groups also have higher rates of complications. HRHN Executive Director Kelly Johnson says their diabetes program helps bridge the gaps in a region where there are long distances between healthcare facilities, no public transportation and large populations of elderly, low-income residents that often have no personal transportation. While there is little data establishing reasons for the higher diabetes rates among rural populations, the situation Johnson cites is common in many rural areas and negatively impacts patient access. Community Health Workers (CHWs) who live in communities where they work are HRHN’s key link between clients and providers. 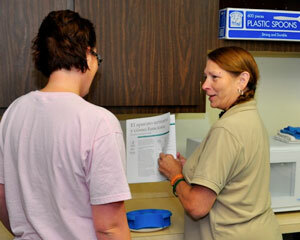 CHWs see patients in their home to assess and assist them with home management practices, and confer regularly with providers about the patients. HRHN’s affiliation with DMCP strengthens HRHN’s services. Patients and providers alike appreciate DMCP’s report card for members, said HRHN Program Coordinator Melissa Thibodeau. Clients receive concrete, understandable information on their medical status and progress. Providers get an immediate snapshot of the patient’s current condition without having to consult multiple laboratory reports. “The report card also helps us make sure diabetic patients are up-to-date on things that fall through the cracks, like eye exams and foot checks,” Thibodeau said. HRHN’s diabetes prevention efforts include a six-week nutritional program, Healthy Eating for Successful Living in Older Adults, which is so popular it has a waiting list and an impressive 87 percent completion rate among participants. More than 1,500 clients have been referred to HRHN’s diabetes program, which was added in 2008 with funding from a Health Resources and Services Administration (HRSA) Rural Health Network Development Grant. A current HRSA Outreach Grant has helped expand the reach of the DMCP. A nonprofit agency, HRHN serves Highland and Hardee counties. Dr. Steven White and KRDC Henry County Community Organizer Mona Huff assess patient packets being distributed to patients with diabetes. The packets contain diabetes education and information about local resources. KRDC formed four years ago to address needs of diabetics in Bullitt, Henry, and Shelby counties, three heavily rural regions where diabetes, obesity and smoking rates are all higher than national averages. All three counties are designated as food deserts, and two are designated as Health Care Provider Shortage areas. Tobacco is a primary crop and local officials have been reluctant to embrace smoking bans. Projects like PhotoVoice raised community awareness and built community trust and ownership, McGeeney said. KRDC equipped diabetics with disposable cameras to document community-specific environmental challenges to a healthy lifestyle. The photo display included empty produce sections in grocery stores, high-priced food stickers and walking hazards. Diabetic patients in three Kentucky counties with high diabetes rates are improving their chronic disease risks by attending a self-management course and support group. KRDC’s efforts to help people with diabetes better manage their disease include implementation of the Stanford Diabetes Self-Management Course, diabetes support groups, peer mentoring and health provider continuing education. 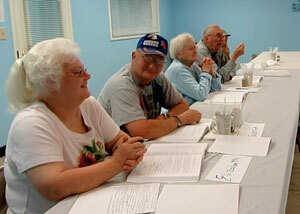 Community participation continues to increase for KRDC’s community awareness events and its Facebook and blog sites. Coalition members meet monthly to plan and measure progress, and then work independently with volunteers in their counties to implement strategies and programs. The Kentuckiana Regional Planning and Development Agency (KIPDA) and the University of Louisville Kent School of Social Work provide support to the Coalition. KRDC’s program is supported by a five-year grant from the CDC National Program to Eliminate Diabetes-Related Disparities in Vulnerable Populations. KRDC program success, including measurable changes in diabetics’ health, will be evaluated in 2015. Diabetes education and prevention efforts have been steadily increasing over the past decade. However, diagnosed cases of diabetes continue to rise. Bolin said some experts attribute increased diagnoses to increased awareness. While diabetes ranks second among RHP 2020 health concerns, Bolin noted that access is the top concern and obesity came in a close third to diabetes. All are interrelated. This entry was posted in Features and tagged Chronic disease management, Diabetes, Florida, Health conditions, Kentucky, Population health, Service delivery models, Wellness/ health promotion/ disease prevention on August 20, 2014 by Rural Health Information Hub.